The gWind™ Wireless transducer offers an easy-to-install solution that eliminates running wires down the mast. Dedicated radio signals are sent through the included WSI connection box and GND 10 black box bridge that allows shared communication of critical NMEA 2000 data between the Nexus Network and Garmin compatible chartplotters. 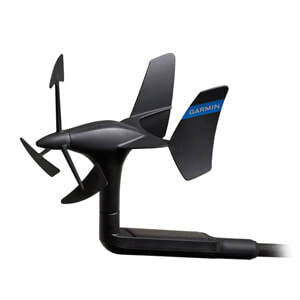 Now Garmin chartplotter owners can enjoy the advantages of Nexus sail equipment and vice versa. Transducer features renowned Nexus twin-fin technology with 3-bladed propeller providing more accurate TWS in lighter air and more stable TWA. Optic reading provides superior accuracy and excellent linearity. Solar panel integrated on the transducer arm with internal solar-charged batteries that last 3 years and are easily replaced. Easy plug-and-play installation between Nexus, Garmin chartplotters, NMEA 2000 and USB.